Azura’ Stevens drives past the defense. Photo by Stephen Slade. 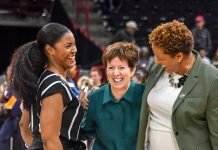 Hartford, Conn. – Continuity of coaching and a culture of excellence go a long way in women’s basketball, and I suppose in many other endeavors, and Notre Dame and Connecticut each have both continuity and culture. Muffett McGraw has led the Irish for 31 years, while Geno Auriemma has led UConn for 32. The teams have played 46 times, and only Villanova’s Harry Perretta has beaten the Huskies more often than McGraw. From 2011-2013, the Irish prevailed in seven of eight meetings. UConn had won the last six, including the 2014 and 2015 National Championship games, leading to Sunday’s contest at the Huskies’ off-campus home in Hartford. The teams entered the season with somewhat different expectations. Notre Dame’s best player, Brianna Turner, tore her ACL in March and is unavailable this season. Four-year point guard Lindsay Allen graduated. And just this week, key freshman Mikayla Vaughn was lost for the season, also with an ACL tear. Yet the Irish entered the game 7-0, coming off three road wins against ranked teams, including South Carolina. McGraw has again molded the players she has into a strong, cohesive, successful team. UConn, on the other hand, returned four starters and their fifth best player, while adding a versatile potential superstar, 6-6 transfer Azura’ Stevens. The Huskies were expected to win every game handily, and thus far, they have, defeating four ranked teams by an average of 25.5 points. But Notre Dame was never going to let that happen to them. Part of excellent coaching is putting players in a position to maximize their skills, and nobody is better at it than McGraw. Further, her teams run half-court sets with unmatched precision. Both aspects of the Irish game were on display against UConn, as Notre Dame led for most of this game, scoring both inside and out, while out-rebounding the Huskies until the final period. At the same time, the Irish defense kept UConn out of the paint with a particularly disciplined zone defense. At the end of a balanced first period that included four lead changes, the Huskies clung to a not-very-secure four point lead, 22-18. Opening the second period, UConn scored the first four points in a surge like those that have discouraged other teams so often. Notre Dame was not remotely intimidated. 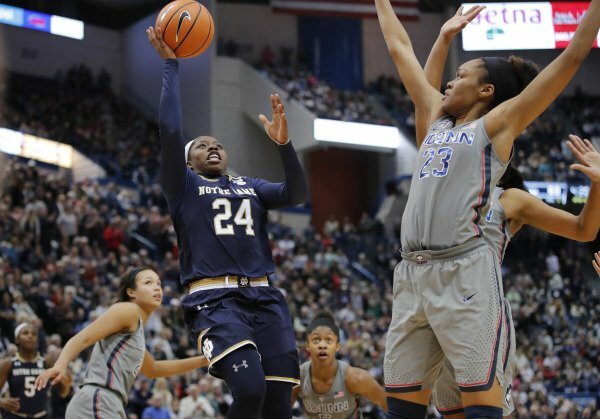 Behind the one-on-one skills of Arike Ogunbowale and the sharp shooting of Marina Mabrey, the Irish went on a 22-4 run and forced Auriemma to call a timeout at 3:11, with Notre Dame up 34-28. The run was helped by series misses by normally-reliable Huskies, but as the half-closed UConn was back on their heels after consecutive Lili Thompson steals for layups. The Irish were also able to use the bulk of their post players to score inside, and a mobile zone defense to keep the Huskies off balance. Katie Lou Samuelson scored a team-high 18 points in her return from injury. Photo by Stephen Slade. UConn entered the locker room in unknown territory. Most obviously, they were down by seven points, 43-36. More striking, they had been outplayed for all but five or six minutes in the game. They out-shot Notre Dame 47-44 percent, but the Irish managed eleven more field goal attempts by protecting the ball (just two turnovers in the half) and crashing the boards (for a 23-15 advantage). Mabrey, averaging 10.3 points per game, had 15 in the first half on 5-7 shooting, 3-4 from beyond the arc. 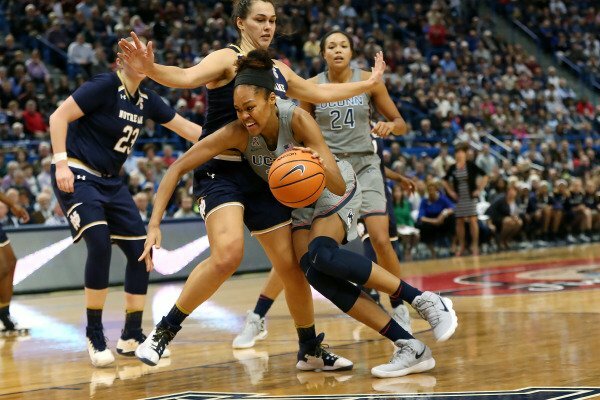 On the other side of the court, the normally-reliable Gabby Williams was just 1-7 for the hosts, and was unable to dominate defensively against the precise Notre Dame attack. Williams has been struggling with migraine headaches, and on this day they were clearly affecting her play. In a very unusual move, Williams did not start the second half. The Huskies came out much more aggressively in the second half, looking like the winners they are supposed to be. Katie Lou Samuelson, playing her first game in weeks after a foot injury, showed no after-affects, and drove the lane aggressively several times. 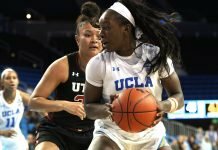 The Husky defense was unable to control Mabrey and Ogunbowale, however, and Notre Dame maintained a seven-point lead for most of the quarter, as the teams traded baskets and fouls. The Irish led by eight, 62-54 after three periods – a lead extended to eleven on Thompson’s three to start the fourth. Through 30 minutes of play, the Huskies seemed unable to exploit their most obvious advantage, Stevens, who battled for position in the paint but only rarely received a pass. The fourth quarter opened disastrously for UConn, as Samuelson rolled her recently-injured left ankle and limped off the court in tears, having led all scorers at that stage with 18 points. Thompson’s second three of the game at the other end, and Notre Dame led by 11. Then the Huskies shifted gears. Without either Samuelson or Williams on the floor, they discovered their offense, defense and rebounding, clicking off a 21-5 run. Stevens was everywhere during the crucial run, scoring inside, rebounding, blocking shots, tipping others. She showed power and toughness, as she battled very physical defense from players with more bulk, and held her own. Two Stevens free throws brought the Huskies within three, and after a stop, Crystal Dangerfield followed her own missed three with a floater to bring UConn within one at 68-67. After a media time timeout, UConn took its first lead since 5:18 in the second quarter. The Irish took the lead back briefly on a drive by Ogunbowale, but another tough inside bucket by Stevens appeared to take the heart out of Notre Dame. Consecutive driving layups by Nurse, a too-quick missed three by Mabrey, and a hard drive to the hoop by Stevens gave UConn a five point lead, drawing another McGraw time out. Although down only by five with over two minutes remaining, the Irish abandoned the precise offense in favor of quick, undisciplined shots. It was not a good strategy, as the Irish missed several forced shots close-in, and UConn crashed the boards for the first time in the game pulling down 14 to Notre Dame’s five in the fourth quarter. Collier and Walker had five rebounds each in the period. With 41.3 seconds remaining, Notre Dame began to foul, and Collier made two to put UConn up by seven. After a few desperation (missed) threes by Ogunbowale and Mabrey, UConn secured the victory by making six consecutive free throws to escape with an 80-71 victory. Walker grabbed two contested boards during the last minute, leaping high over the pack, and hit both of her free throws. Arike Ogunbowale shoots over Arura’ Stevens. Photo by David Butler II/USA Today. 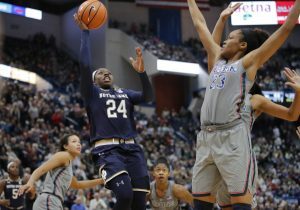 Notre Dame led for 25 of 40 minutes in the game, but Connecticut outscored them 26-9 in the fourth quarter, shooting 64 percent to 20 percent in the period. The determination showed by the Huskies was a sharp contrast to their melt-down in the final ten minutes in last year’s Final Four loss to Mississippi State. The home town crowd nearly filled the XL Center, which holds 16,024. Official attendance was 15,564, and once the home team gave them a reason to cheer, the building was as loud as anyone had ever heard it. Both the players and Auriemma credited the fans with fueling the fourth quarter dominance, and disrupting Notre Dame’s communication. Stevens, who has matured as a player during the four games Samuelson missed, played with energy and aggression for long periods of this game, and was clearly the difference. Coming off the bench in this game, she solidified herself as one of the best in the country. In 26 minutes she scored 17 points on 7-12 shooting, with ten points in the fourth quarter. She also grabbed eight rebounds (tipping several others to teammates) and blocked two shots. Her defensive activity and height altered numerous Notre Dame shot attempts. Watching her from the bench Samuelson was excited by Stevens play. McGraw was clearly upset at letting the game slip away. As she entered the interview room, she delivered her game assessment before she even sat down. Auriemma almost seemed like he wished UConn had lost, as he was not excited about the comeback. Despite the win, the UConn players were hardly ebullient. 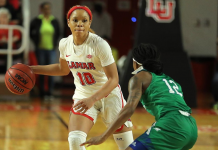 The fourth quarter was also something of a showcase for Walker, and Auriemma attributed it to her sticking to the role she fits best at this point in her career. Mabrey scored 21 for the Irish, hitting 4-9 threes. Ogunbowale added 19 points, but was just 1-10 from beyond the arc. On drives to the hoop, on the other hand, she was 7-15, and Auriemma was thrilled that she missed that many. Notre Dame plays Michigan Wednesday, in only their second home game of the season. UConn plays at DePaul on Friday.